Here you can see a list of available orders and a summary about each one. Clicking on any invoice will redirect you to the invoice details page where you can see other details. In the above image you can see a highlighted button. 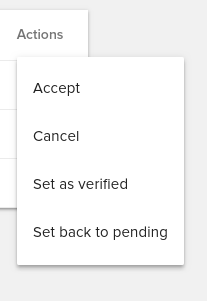 Clicking it will trigger the following dropdown where you can make different actions that will affect the order. On the order details page you can see other details like the order’s total, currency, due date & issue date, the associated client & user, the order id and ordered items.